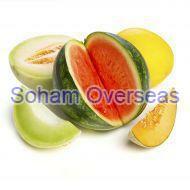 Fresh Melon Supplier In Gujarat - Inquiry Now! By fulfilling the domestic as well as international demands, Soham Overseas has emerged as a venerable fresh melon supplier in Gujarat. We are assisted by an adept team of professionals, which enables us to supply fresh and juicy melons within the provided time frame. We have contacts with some of the reputed farmers in the industry, who provide us an authentic grade fruit at the prevailing market prices. We work in complete compliance with the agro-industry norms to attain an indelible position in the market. Our proffered fresh melons are abundantly demanded by the departmental stores, hotels, and fruit markets all over the globe because of the virtue of their rich taste, high nutritional value, long shelf life, and authenticity.